You land on a long form sales letter selling some information product -- and the price is going to be going up significantly on that product. Maybe 48 hours or even sooner. This is scarcity at its simplest. The reason marketers use it is because you - if you're a normal person - respond more to fear of loss than a desire to gain. Scarcity is also one of the great ways - if not THE greatest - to knock a prospect from "maybe..." into yes territory. Now, there are two core types of scarcity - genuine scarcity and false scarcity. False scarcity would be something like me saying the price is going to go up two days from today. Then you come back after the price was supposed to go up and... lo and behold... it's still the same. These happen because either the marketer was lying to try to create urgency for you to purchase... or... they simply forgot to update the page. Maybe they just hadn't gotten around to it. The result is the same: even if they had every honest intention in the world of manually updating the page to reflect the new price (or whatever), it didn't happen. In their visitors eyes they appear like liars. Credibility is lost. Reputation is damaged. Making money becomes harder. For the most part, a large part of this community considers me one of the rare "good guys" in an industry filled with slimebags and "used car salesman" style marketers. When I launch a product I almost always have a 48-hour window that I allow my own email subscribers to purchase my product at the lowest price it will ever be offered at. It's my way of saying thanks for being a customer and on my email list. Which has resulted in over 3 Million dollars in sales over the last 18 months, roughly..
One time I remember doing this for a product - only not raising the price in time because I slept in... since my daughter, who at the time was less than a year old... was up all night sick. ...Who was trying to trick them into making an emotional, impuslive purchase - without any intent on raising the price. I realized then that there needed to be a tool that would do all this for me automatically. Let me show you a technique where almost every marketer - even experienced ones... are missing a whole boatload of profits. To do this, let's walk through a scenario. Say you want to do a webinar because you heard they can make you a lot of money. It's true, they can. You'll be doing a webinar on Saturday, April 20. All the traffic you send right now will go to the webinar sign up page. Let's take it a step further. When you send out the replay of your webinar, you put it on a page where someone can go and watch the recording of the video. Typically about half of your sales from a webinar will come from people watching the replay of the video on a web page. If you allow that webinar video to be watched whenever, wherever. If people can "get around to" watching it later... because there is no penalty in delaying consumption... guess what? Later becomes never. In other words, you're missing out on a whole chunk of sales because of people not even watching the webinar replay at all. 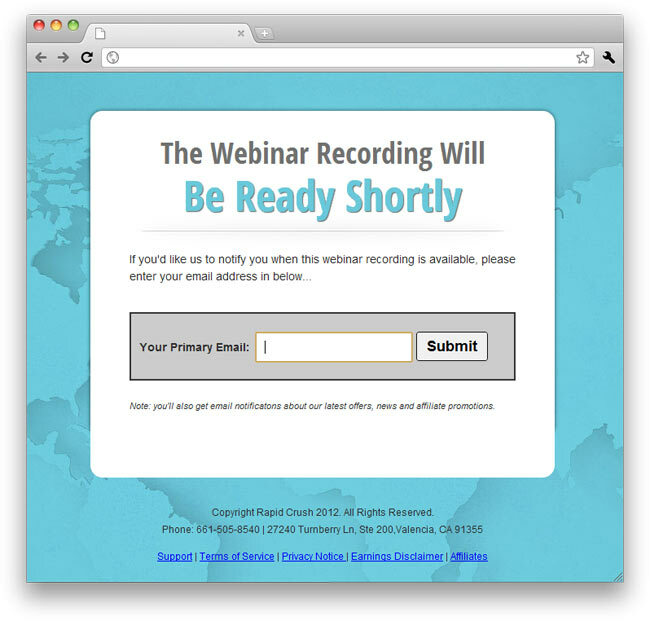 Instead - you could do something like this: put a countdown timer on a page that says "This webinar replay will only be available for the net 48 hours, then it will taken down forever..."
If you're used to making $3,000 on the webinar replay before... you might want to double that number now! Because a lot more people will watch it who otherwise would put it off, indefinitely. Using this new software we created - WP Redirector - this is one of the many ways it makes us a bunch of money automatically. For our webinars, here is what we do. Say we're doing a webinar on Wednesday, April 24. A few days before we'd send all our traffic to a webinar registration page at a url like http://example.com/whatever. This is nice because up until the webinar - and even while the webinar is live - if someone goes to that link they will be able to get to the webinar. 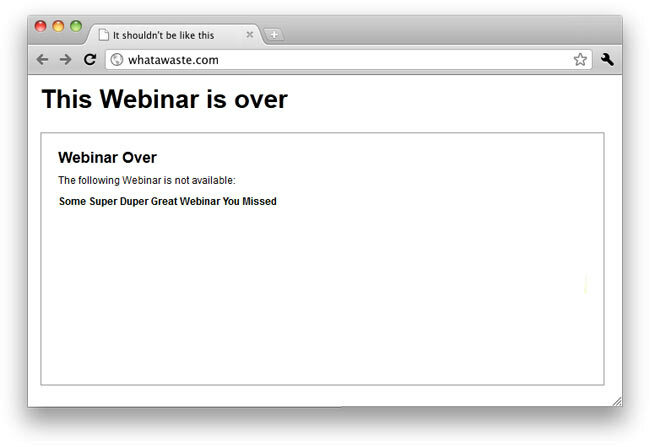 I don't think you realize how many people go to a webinar registration page AFTER the webinar is over. Consider the fact that the average email is opened and read 48 hours after it is sent... it makes sense. So if an affiliate of ours mailed to this page - in the past we would just have to wave bye bye to that traffic. After we render the webinar recording, we upload it and make it available on the Internet. Now if someone goes to http://example.com/whatever -- they will see a the replay... also with a countdown timer letting the visitor know the replay will be up shortly - then it will expire. Finally, when it does expire, we send them to a page like this - where again we can capture the email address. Now I'm not sure you're aware how cumbersome and challenging that would be to do manually. We do it automatically with WP Redirector. It's simple. Install this plugin on any WordPress blog. Then create a new page or post... and underneath the visual editor click "add a redirect". This will bring up a calendar, where you can select when you want the redirect to occur, timewise. Back date it if you want to the 1st redirect to take place immediately. Then, if you wish, you can click "add a redirect" again and add as many time based redirects as you desire. What Can You Use WP Redirector For? Say you're doing one of those fancy product launches that gives three pieces of free content... over a period of a week or so... which culminates in the launch of a new product. Way too much manual for my taste. Did you know WP Redirector can do all that for you automatically? It's simple - just set your pages up ahead of time, and then put the URL of each page into WP Redirector, with what date and time it should redirect to the next page page. Have a page where you promote something as an affiliate where you offer a special bonus. Say you offer this bonus only for a certain amount of time before it's no longer available. In this case you'd have to manually set some sort of alarm to tell you - "okay, time to remember to go change the page because this bonus is no longer available." Now with WP Redirector, you never have to worry about doing this manually again! Say you want to entice people to keep coming back to your web page over and over again. Here is what you do - you set it so each day a bit more content is released... with the future content being teased as "coming soon..."
All you have to do is use WP Redirector -- and now you can do this easy as pie! You should absolutely use time-based scarcity in your marketing. In any instance -- WP Redirector will make your time based scarcity much more effective because it completely automates it! Whether it's a "4 day cash machine" style sale, bonuses, or offers going away after a certain period of time... it doesn't matter! WP Redirector will be a godsend for you. Just ask for it - and it will be returned promptly and quietly to you. Plus, we can still be friends. By the way, here is our support desk should you need to request a refund or need any product assistance at all with your purchase today. P.S. - whichever version you choose today, you can always purchase additional licenses later to install on more sites... (unless of course you get the unlimited version - then use it as much as you want on any of your sites! ).